It’s common for ice to form on the river every winter. 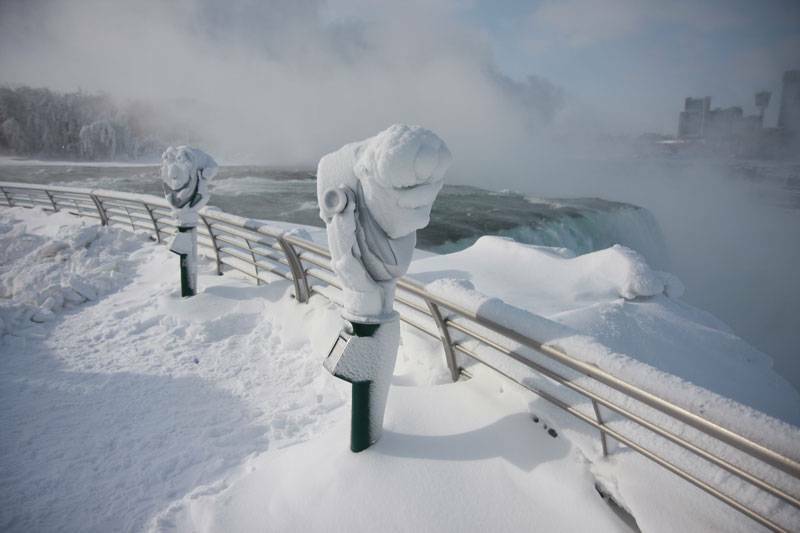 No, this isn’t the work of Hollywood or an internet prank, Niagara Falls actually can form a layer of ice! In fact, it’s happened in this dramatic fashion several times before. This spectacular event is the work of prolonged frigid temperatures combined with some sneaky science. 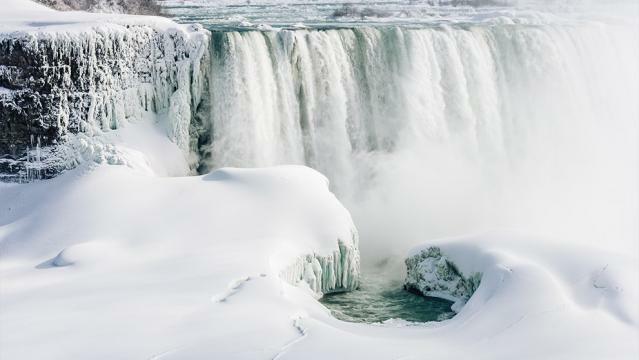 Let’s take a look at the facts behind Niagara Falls freezing as well as the history of major freezes. Do the Falls actually freeze solid? Not quite. Prior to 1964, ice could block the flow of water further up the river, reducing the volume of water on the US side of the Falls to the point of freezing. This happened five times before steel ice-booms were added to prevent large collections of ice. More recently, the frozen effect you’ve seen is similar to any other river or lake that freezes. Surface water and mist in the air turns to ice, but there is still plenty of water flowing. The volume of water that makes up Niagara Falls combined with the constant movement of the river makes a total freeze nearly impossible. What makes the ice buildup so dramatic and beautiful is that water can freeze as it’s going over the falls, creating a large collection of ice below that can be well over 40 feet thick. This phenomenon leads to the amazing ice formations you see pictured here. If you look carefully though you’ll see that sections of the falls are still flowing like usual. It’s common for ice to form on the river every winter. The extent of the ice collection at the base of the falls will vary depending on how many days or weeks of sustained cold hit the area. When extreme cold hits for long periods of time, like the polar vortex events of 2014 and 2015, we can see massive collections of ice that make for famous “frozen falls” photographs. No! Ice over a rapidly moving body of water like you’ll find at the base of the Falls is very unsafe. Almost a century ago, people were allowed to walk on the ice bridge and it became a regular part of the attraction in winter, however that changed when three lives were lost due to breakage in the ice. Looking to visit the frozen falls? Here’s how to spend your day in Niagara Falls if you’ve come for this winter phenomenon, from lunch and follow-up activities to dinner, drinks and where to spend the night. Want to learn more about Niagara Falls? Explore the Falls here!